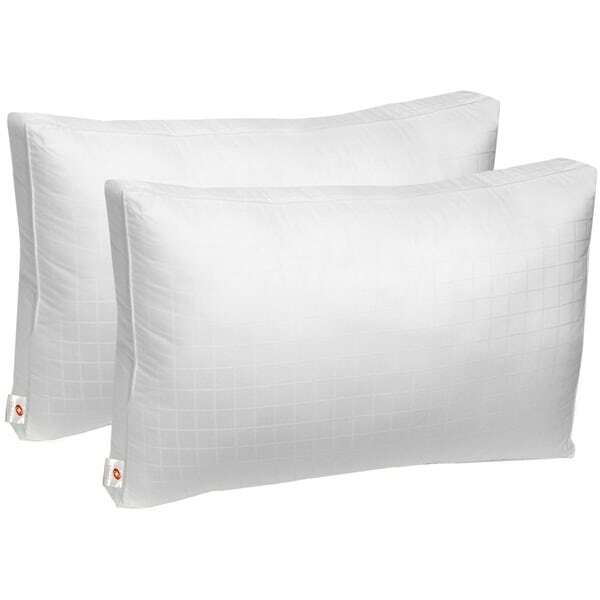 The Swiss Comforts down-alternative pillow, available here in a two-pack, features 100-percent cotton outer construction in a 300 thread count. Filled with 100 percent hollow, siliconized coil fiber with two-inch gussets, this pillow offers additional neck support for a restful night's sleep. Double sateen piping all around gives it a distinguished accent. Good price for this pair of king-size pillows, which were exactly what we wanted. We use them between three Euro pillows and two sets of standard pillows; they hold their shape sufficiently for support and fill out king shams perfectly. The gussets are a bonus that we also like. These Swiss Comfort pillows are very nicely made and comfortable to sleep on. I'm a side sleeper and like to tuck the pillow up around my neck and let my head tilt down into the pillow. These are perfect for me and one lasts. I made the mistake of giving my husband the second pillow. Now he likes them,too, and I need to order him some! I just received these yesterday and OMG they are the best pillows I've had in years. Perfect support whether you are on your back or side. I just ordered two more sets in different sizes and will be ordering a third. These are definitely worth getting!!! I thought I had ordered the Queen size pillows but on accident I ordered standard. I love the feel of the pillow it is lightweight but it has just the right amount of firmness that I need. Ordered two sets. will be ordering two more sets nice for the price. Nice and comfortable. Sleep like a baby. Worth the money. My boyfriend loves them too. These were a good price and good quality. I do not like a hard pouffy pillow. Im used to old school, feathers and down. Comfortable and just perfect. Made in Canada. Thank you! Love these! So cozy and comfy. These pillows are super fluffy and stay true to its fluffiness. down-alternative pillow, available here in a two-pack, features 100-percent cotton outer construction in a 300 thread count. Filled with 100 percent hollow, siliconized coil fiber with two-inch gussets, this pillow offers additional neck support for a restful night's sleep. Double sateen piping all around gives it a distinguished accent.